The Major Play™ Matrix Synthetic Turf System precisely emulates natural grass and clay. The area of the turf is tailor made for pitching, hitting, sliding, ball bounces and speed consistent with natural ballparks. The Major Play is offered with options such as twisted fibers (Helix), thatch (thin layer of fine textured fibers at the root of the turf) and both combined that delivers durable field with stable footing. DALLAS, Jan. 3, 2019 /PRNewswire/ -- Hellas Construction is unveiling a new Major Play™ baseball turf system with a custom designed synthetic turf redefining the field. 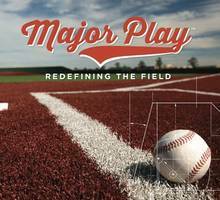 Major Play™ precisely emulates natural grass and clay without the maintenance cost associated with both. Each area of the field is tailor made for pitching, hitting, sliding, ball bounces and speed consistent with the best natural grass ballparks. The first pitch is on January 3 at the American Baseball Coaches Association Clinic at the Gaylord Hotel in Dallas. tandard Major Play Fusion™ turf is created with a blend of monofilament and slit-film fibers manufactured at Hellas owned textile and fiber factories in Georgia and Alabama respectively. When combined, the fibers act as a blended workhorse turf guaranteeing true playing characteristics of natural grass. Available in dual colors, Major Play Fusion™ provides a customized solution for high utilization, functionality, and performance for all seasons. Premium Major Play Matrix® turf is produced with monofilament fibers, which are exceptionally strong and designed to bounce back after use, while preventing splash-out of the infill. These fibers can be enhanced and manipulated in the manufacturing process to perform differently when installed. Major Play Matrix® Turf maximizes ball roll with minimal resistance for true bounces. Whether it's Standard Major Play Fusion™ or Premium Major Play Matrix, Major Play turf includes options to customize the field. Option one includes Helix technology, which is twisted fibers to add structure and strength to the turf. Helix also adds longevity to the field with better performing fiber. For Fusion, Helix can be applied to 50% of the fibers in the field. For Matrix, Helix can be applied to 100% of the fibers in the field. Option two includes thatch, which is a thin layer of fine texturized fibers at the root of the turf. Thatch increases fiber support and weight, while reducing the amount of infill required. Option three is Helix and thatch combined to create a more durable field with the most stable footing. Hellas offers high-density replaceable carpet with shorter pile height for high traffic areas where sliding takes place. The soft, yet firm, underfoot prevents the turf from buckling in extreme temperatures. The skin area or infield clay is reliable when it comes to speed and consistency in the ball roll, eliminating "bad hops". Hellas is currently constructing new baseball and softball fields with Major Play Turf throughout the United States including Lamar University in Beaumont, Texas. Custom logo options and alternating patterns are also available for a fresh-cut look. Major Play Turf by Hellas Construction a perfect pitch for baseball.